Everyone who wants to make significant performance upgrades on their car often times upgrades the exhaust system, replacing the stock one with an aftermarket performance exhaust. However, a lot of people don’t do it for the performance itself, but for the visual looks and sound. We all know the purpose of the exhaust system so I won’t get into that at all, but there’s one question that seems to trouble a lot of people – whether they should go for a stainless steel or an aluminized exhaust system. 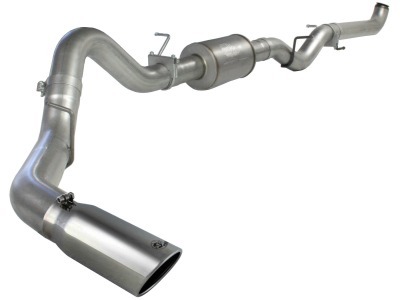 When choosing an exhaust system and making the decision between a stainless and an aluminized exhaust, you need to be aware of the pros and cons of both, so that you can make an informed decision. Taking into account your needs and especially your location is essential before making the decision, as these things will certainly impact the longevity of your exhaust. Knowing that a lot of people care only about appearance, we’ll start off with it. If you are one of those people, stainless steel has a small advantage over the aluminized steel because it can be polished and it will look new for a much longer period of time when compared to aluminized steel. However, stainless steel is more expensive and over time it can become discoloured because exhaust systems reach high temperatures. So unless you’re constantly polishing it and cleaning it, the extra expense might not be worth your money, as far as looks are concerned. Now on to the more important matters. The area you live in, and the fact whether it is characterized by snowy winters or not, can be a deciding factor. Aluminized steel is great for dry areas, and in fact, it’s the preferred choice. Stainless steel is more corrosion resistant and it’s the better choice if you live in areas near salt water. A quality stainless steel and a quality aluminized steel exhaust can outlast your car. They’re built to go more than 2 million kilometers, and still stay intact. However, only you can determine how long you plan on using your current vehicle and how much you’ll take care of it. If you plan on replacing your car within a few years, aluminized steel is the smarter choice as it’s much cheaper. These few tips should give you some insight and help you make the right decision. To sum it up, the stainless exhaust is pricier than aluminized, however, it is slightly better if you live in a highly humid area. It can look newer if you take proper care of it, plus, it’s corrosion resistant.